上网搜索之后，看到解决方案是修改build.gradle文件的一些配置，可是我导入的示例在build.gradle全是空的，什么都没有。我点击:FIx plugin version and sync project，出现错误：Error:Unable to find method 'org.gradle.api.artifacts.Configuration.setExtendsFrom(Ljava/lang/Iterable;)Lorg/gradle/api/artifacts/Configuration;'. 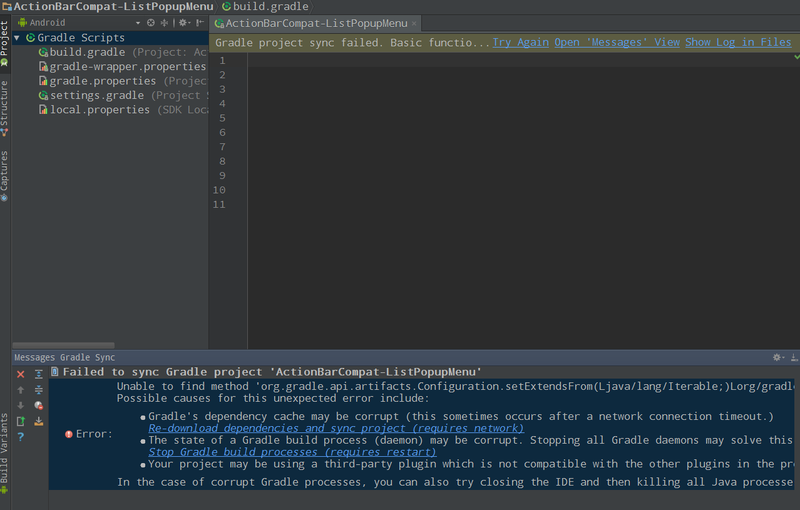 The state of a Gradle build process (daemon) may be corrupt. Stopping all Gradle daemons may solve this problem. Stop Gradle build processes (requires restart)Your project may be using a third-party plugin which is not compatible with the other plugins in the project or the version of Gradle requested by the project.In the case of corrupt Gradle processes, you can also try closing the IDE and then killing all Java processes.